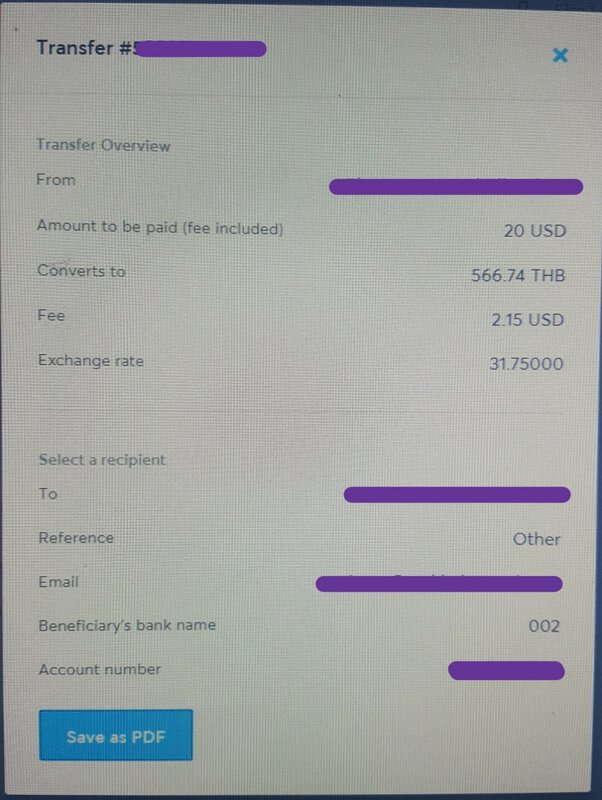 Are any of you using TransferWise to send money into Thailand? I'm trying to set up an account with them and they are asking me to enter the beneficiary's bank name. Is it alright if I just type in Bangkok Bank or do I need to state the city as well? Cant recall what I put in in my case for certain but it was certainly no more than the name Siam Commercial and certainly no address given by me. Your Bangkok Bank account number tells them which branch. I put MY name as beneficiary. Works 100% well. When you start typing in the bank's name like Bangkok Bank, TMB, Kaiskorn, etc., a list should start appearing right below it.....select the bank name from that list. You are just entering the "bank" name; not the "branch" name like the branch in Nakhon Nowhere. An email address - not the one I'm using to send though - my choice to keep them separated and I use a different email for online banks anyway. A SCB account number tells the system everything it needs to know. If you're thinking of British banks, there are no sort codes in Thailand. Therefore I guess the same applies with Bangkok Bank as @wgdanson implied above. It does not auto generate nor did I get a pop-down list when I tried. I just typed in Bangkok Bank and it let me proceed to the next screen. When all was said and done it registered the bank code as 002. The transfer is now on its way so let's see what happens in the next few days. 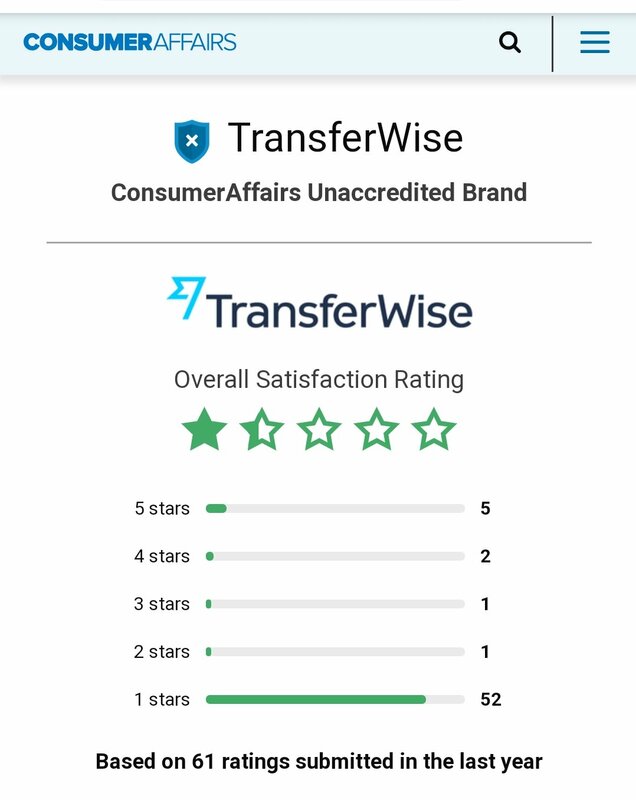 I've also been reading numerous bad reviews about TransferWise. People being shut down and accounts being cancelled. Is there a safer platform that I can use when sending money from the US? Below is a screen shot of from my TW Activity page. The first sceeenshot shows the pop-up which appears when I click View Transfer Details. As you can see the Beneficiary's bank name defaulted to 002. For those of you sending from the US do you also have the 002 showing? Yes, mine shows the same way after the transfer is initiated/completed but "during" the setup of the transfer when entering the the bank name it shows the bank actual name name...not a number like 002. 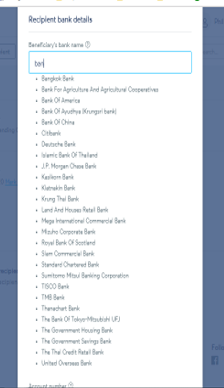 Like were you earlier talked about a pull down list not appearing for you, like I get below, when entering the beneficiary bank name.....like were I start off just entering the first three letters of "Ban" Bangkok Bank a list of suggested banks start appearing right below the "Ban" entry....I then select Bangkok Bank. Yes, mine shows the same after the transfer is launched. 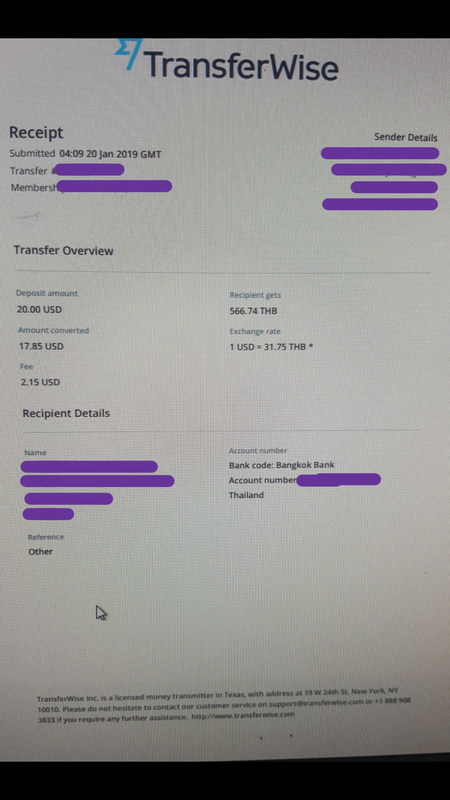 The 002 representing Bangkok Bank on your first snapshot above is more for Transferwise internal use...as you see on the more detailed receipt it specifies the actual bank name. I just did tried to enter a new recipient and yes you're 100% right the pull down does appear. Thanks for the confirmation as well with the 002. Can you please tell what other money transfer platform you would use if Transferwise did not exist, and you still needed to show out of country deposits coming into your bank on monthly basis? OFX might be one to consider....their exchange rate is not at good as Transferwise but their fees are lower...however, when the "exchange rate and fees" fully considered Transferwise still comes out on top. Now if you got to the OFX public website they only show the mid-market rate "and not their actual customers rate" which you can only get once you have registered with them. Below is a partial snapshot of a larger spreadsheet comparison I did for rates on 3 Aug 18...it uses OFX "customer rates." As you will see Transferwise beat OFX for all the amounts compared. Other than money transfer services like Transferwise you are pretty much left with using SWIFT from your US bank and none of them use ACH "IAT" format for retail accounts. As you know come 1 Apr 19 the Bangkok Bank ACH method will no longer work for transfers thru their NY branch due to their ACH IAT that goes fully into effect 1 Apr 19. But if you are just looking for a way to get money into Thailand cheaply and don't care about it appearing as an international transfer on your bank account, "then using no foreign transaction fee debit cards" that reimburse ATM fees....or doing a counter withdrawal with those no foreign transaction fee cards is the best way to go. While most US debit cards are limited $1000 per day (or even less), at least one...the Cap1 debit card...allows $5K per day at a counter plus another $1K at an ATM. Using a Cap1 debit card to do a $5K counter withdrawal with zero fees is hard to beat. In fact if I had posted the entire spreadsheet comparing those things shown in its title vs the partial partial one below, the using a no foreign transaction fee Visa/Mastercard debit card for a counter withdrawal ended up giving you the most baht at the least cost....and you definitely get the baht faster (immediately) using that method. If using OFX sending from the US, will Bangkok Bangkok still show it as coming from overseas? I need this for immigration purposes. Don't know....never actually did a transfer once I got my account....didn't do a transfer because Transferwise was a better deal. Plus on weekends OFX didn't give update USD-THB rates...basically THB udpates only occurred Mon-Fri. Several things just turned me off about using OFX after I got an account. Maybe in the future. $2.15 to send £20 is over 10%. Yeah that's true, but basically I did this amount as a "test run". I have read so many good things about TW, and so many bad things as well. Supposedly they have shut people down without any notice or explanation. The people who had this happen to them weren't able to get any type of support, and their money now is forever gone. This new change scares me a bit. Using ACH NY Bangkok for the past year felt really secure.